A bill, which is currently before the Massachusetts Legislature, has got my attention -- and I think it should get yours too. If MA House Bill #3320 and Senate Bill #1209 (Act to Remove Obstacles and Expand Abortion Access, hence the ROE Act) become law, our legislators would have approved a law that seriously offends the dignity of human beings, threaten our civilization, and cause unspeakable pain to other human beings like us. We have reached this point because some legislators have arrogated to themselves the right to decide on who should live and who should die. Although the bills are worded in the context of promoting women's rights and healthcare, if passed, these bills will be lethal to children, and they will amount to an abuse of power by some adults at the expense of the weakest and the most vulnerable in our society. None of us asked to be born, yet all of us were conceived. I have lived on the streets with poor people, fought for the rights of immigrants on both sides of the fence, and I have marched with the Rev. Jesse Jackson to make a statement about the immorality of deploying the Pershing II missiles to Europe. I am also for women's rights and for all that promotes and respects their dignity. I believe in empowering women to unleash their full potential in our society, privately, personally and professionally, as women and leaders in whatever capacity they choose to fulfill themselves. Yet I cannot comprehend why some legislators seem bent on making us believe that the way to promote women's rights and to advance their dignity, is to demonize children and to pit them against women, to demean the genesis of human life by equating pregnancy with sickness, to identify a human person with products of conception, and to infer boldly that a child is an impediment to a woman's happiness and fulfillment. If the ROE Act becomes law, the womb, which technically should be the safest place for any person before he or she sees the light of day, will become the most dangerous place to be, no longer a welcoming place but a battlefield where you may be sucked out of life before you even have a chance to speak or to defend yourself. 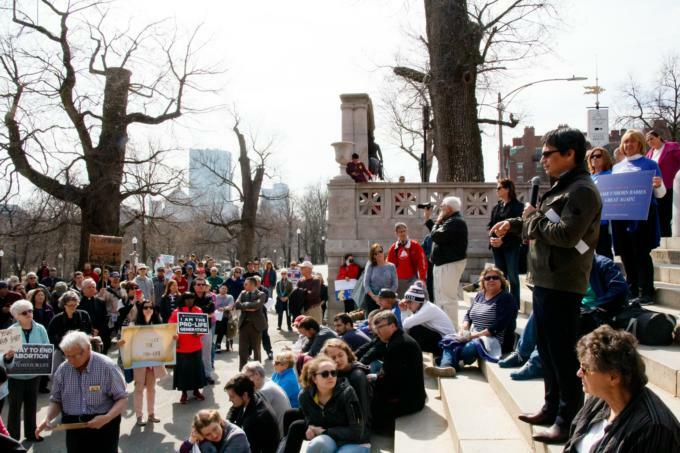 The ROE Act will make abortions on demand in the Commonwealth of Massachusetts possible during all nine months of pregnancy. The ROE Act will do away with any requirement that even late term abortions be performed in hospitals. Next, it will enable any young girl to undergo an abortion procedure without the need to obtain consent from a parent or legal guardian. Think about it: a girl cannot so much as receive a Tylenol pill in school without parental consent; yet, it's as if some legislators would "drive" her to an abortion clinic where she is stripped of her dignity, dressed with sadness and anxiety, and probably embarks on a journey of indelible grief for the pain of having "killed" her child. And all this, while she is still a "child" herself, while neither parent nor guardian need to know what's going on with her! The ROE Act would also remove any requirement that efforts be made to save a living baby who survives the abortion procedure. I don't know about you, but just writing this gives me the chills. How much longer do you think that we can keep this hidden from our children? And if this bill becomes law, how can we still regard ourselves as the greatest nation on earth? Look at New York, from the Governor to the last legislator: what a loss for our society, what a tragedy for the future of humanity that those who should lead by example have become so darkened and callous that they lose even basic common sense! We used to speak of the barbaric practices of communist Russia and China. I lived in China where I heard how easy it is for a woman to get an abortion; it's as easy and fast as for a man to get a drink in a bar: you're in and out in a matter of minutes! But we are the United States of America, the greatest and most successful experiment in enlightened government of the people/by the people/for the people! Please help me! Where have we gone wrong, that our brightest minds have become so dimmed that we no longer can tell the difference between struggle and murder, conflict and vengeance, good and evil?! Even the poor and the least educated among us, surely know the difference! This is not a matter of ideology, no more than a human person should ever be the pawn of political ambition or the means to a corrupt and evil end. We need to stand together for authentic human progress that respects and promotes the rights, the dignity and the wellbeing of all people created in the image and likeness of God, of women and of children who did not ask to be conceived but who should be afforded the decency and the safety of the womb! Authentic progress loathes deception, especially of anyone who preaches from a high social or political platform, and all lies degrade us. And if you don't agree with me, try this for an experiment. Are you an adult? Tell the children around you that your life matters more than theirs. Are you a parent? Tell your children that they do not have an inalienable dignity but are merely products of your decisions. Let's see how far that will get you with them before they become depressed, bored with your bourgeois ideals and resort to drugs, drinking and gambling as a remedy to gasp for some self-esteem. We must be honest and call things by name, lest we live a lie. These bills are deceptive! A woman carrying a child is not sick because she is pregnant, just as a baby in the womb is not stupid or dumb because he won't speak or defend himself even as we plot to get rid of him! The ROE Act is morally perverse and socially dishonest. We must help girls and women live with dignity, not by abdicating their right to seek help, much less to succumb to "the physician's best medical judgment," but by empowering them over their bodies. As we have unmasked priests who preyed on children as "wolves in sheep's clothes", legislators must realize that motherhood is not irreconcilable with meaningful success, or happiness incompatible with having children. We must help women take back what belongs to them, namely their God-given authority, which they exercise at home and in the workforce, privately and professionally, whether they are single, married, with or without children. And we must stop with the hypocrisy of ambiguous language does not nothing more than serve an ambitious and sinister agenda of some legislators bent on advancing their own political career, with obvious disregard for the common good and the wellbeing of citizens. We are already in a crisis, and we risk becoming an even more sad and sorry society. When we see a sign on the highway, an Amber alert that ONE child has gone missing, every driver in every car is moved, as much by anger as by the desire to spot that vehicle, to find that child that has been snatched away from the comforting and caring presence of a mother. Today, there is not just one but many children who are missing: they are missing in our families, in our playgrounds, in our schools, in our churches. The ones that are missing, unfortunately are gone forever! Yet, we can effect change that will impact many others who are totally dependent on us to make it through nine months in the womb. Let's help them today, and we may just find that we are also helping ourselves. Even if the children that "escape" our devices, later decide to institutionalize us, the elderly, their parents, or approve legislature to kill the infirm, the elderly, those born with some form of handicap, our moral duty to help children today navigate the murky waters of their first nine months in the womb is still the right thing to do, is still worth our effort, and we should let nothing distract us from this most noble goal! If this makes sense to you, contact your representatives and tell them to vote No on MA House Bill #3320 and Senate Bill #1209, "Act to Remove Obstacles and Expand Abortion Access". Act now, because time is really of the essence here! Delay, and it might just be too late.